London-based solo artist G.Logan continues to establish himself with his productions. 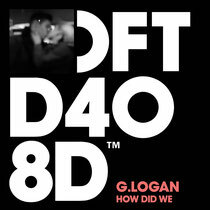 Boasting previous production credits for the likes of Kelis, Jay Sean and Craig David, his latest release, ‘How Did We’, on Defected Records acts as further evidence of his talent. First heard on his self-produced 2012 mix-tape ‘Almost Gave Up’, ‘How Did We’ combines deep and atmospheric house vibes with warm vocals, highlighting his soul and R&B background. The synergy is a melodic narrative focusing on two people’s coming to terms with their relationship. First up on the remix front is Jovonn’s Mix which is led by a fuzzy bassline and Logan’s now chopped vocals before introducing his emotive chorus topped with piano chords and warm synths. Friend Within’s version utilises heavily swung percussion which compliments the stuttered vocals before gradually building into a mammoth drop and what may be one of the bassline records of the year. Jovonn makes a second outing on the release with his Deeper Deep Mix and finally there is the Club Edit of Logan’s original. It’s out September 16, check it out below.